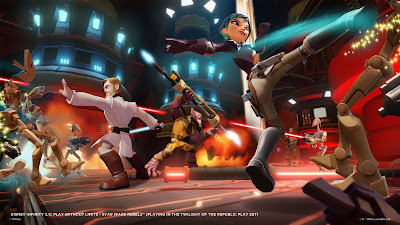 I picked up Disney Infinity last month, mostly for my kids. The real tipping point for me was that it had both Star Wars (for me) and Inside Out (for my kids). Star Wars, as you well know, is my favorite fictional universe. And Inside Out has been my kids' favorite movie ever since they saw it. Since my September was crazy I barely got to touch this game until a few nights ago. Mostly my kids have just been playing in the "Toy Box" section of the game while swapping out characters and making up their own games with each other. That's exactly why I got the game for them and they seem to be having a ton of fun with all the characters they love. The Toy Box is great for kids, but I find it kind of underwhelming as an adult. There's a ton of stuff to see and do, but none of it is directed enough to really drive me to do it. That's where "Playsets" come in. In Disney Infinity Playsets are much more of a traditional video game. They have a continuous story, levels, quests, and an overall objective. We currently have all three Playsets that are available, although more will come out for this version of Disney Infinity over the next year. My daughter and I dug into the Inside Out Playset one night when her little brother went to bed early. It's mostly platforming and we had a lot of fun together. She could do most of the challenges but I had to help her in a couple tricky spots. Overall, it was fun for both my 5 year old and me. Then, over the course of two nights, I played both Twilight of the Republic and Rise Against the Empire. They were great! Twilight of the Republic is all about being a Jedi during the clone wars era. Asoka and Anakin are the main characters that come with the Playset but you can pick up other characters like Yoda and Darth Maul too. It was so much fun to have some decent lightsaber combat in a new videogame for the first time in years. And if you're a fan of the Clone Wars TV show you'll recognize a lot of the characters in this Playset. Rise Against The Empire was my favorite of the three Playsets. It comes with Luke and Leia but you can buy the figures of Han, Chewie, Boba Fett, and Vader to play with as well. It retells a simplified version of the Star Wars original Trilogy. I loved getting to experience it this way. The Playset hits all the high points in the original trilogy. As long as you can get out of the very first (and only boring) questhub of the game on Tatooine the rest of it is a pure joy to play. I especially loved piloting X-Wings and the Millenium Falcon in their iconic runs against the two Death Stars. Disney Infinity runs a little on the expensive side, but I made the calculated decision that I would enjoy the Star Wars figures even if I didn't enjoy the game. After playing through the Playsets I feel like I've gotten my money's worth. And my kids are still having a great time in the Toy Box mode. I'm really excited to see what the next Playsets are going to be. Since I've already done the initial investment of getting the game bundle with the game itself and the figure stand... chances are good that I'll keep picking up Playsets as they come out. Currently the next two announced Playsets are The Force Awakens (AWESOME!) and Marvel Battlegrounds.